The COFFEE QUEEN TOWER is a stylish, easy to use bulk coffee brewer. Featuring automatic water filling, digital display, full and half brew functions and a signal for when the coffee is ready, this unit has all the functions required when catering for large events. The hot water outlet (for tea) has a virtually unlimited capacity and the coffee brewing takes place directly in the 5 litre serving station (vacuum thermos) that have a unique heat retention system to ensure your coffee stays hot for hours! Brewing can take place on both sides of the TOWER simultaneously and the digital display shows the current temperature, brewing in progress and the volume on each side of the tower. 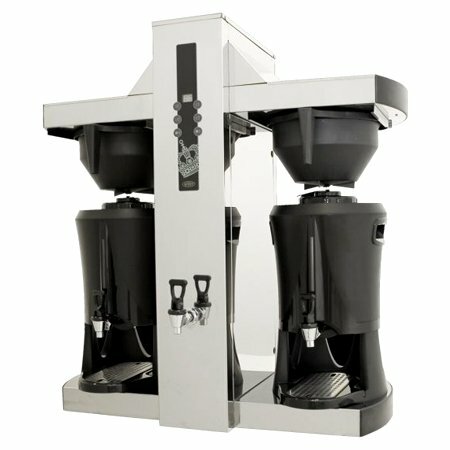 The TOWER is not connected to power so it offers great flexibility in where you are able to serve a great tasting coffee!